Hypnotherapy is the key that allows you to gain access to your uncounscious mind. By experiencing a trance state, with the help of your therapist, beneficial suggestions can be given directly to the powerful part of your mind. With a short number of sessions, lots of conditions can be successfully treated. Hypnotherapy, or clinical hypnosis as it is sometimes referred to , is a natural and effective technique that allows you to gain access to your unconscious mind. You could say that it is the key to unleashing your true potential, changing your unwanted habits and behaviours and finding solutions to your problems and concerns. And hypnotherapy uses hypnosis as part of this process. Hypnosis is an altered state of awareness and consciousness that we choose to call trance. It is worth remembering that trance is a natural, and pleasant state of relaxation that you allow yourself to enter. Unlike the mythical mind control implied by stage hypnosis, you cannot be made to go into trance if you don’t want to, and you certainly cannot be made to do things whilst there if you don’t want to either. Just as an aside and to further pull apart this myth, the people who volunteer for stage hypnosis are not under any form of mind control. Far from it; they are willing participants who are carefully tested for suggestibility so that those who eventually get through to the “hypnosis” part of the show give the appearance that hypnotist is controlling them. Hypnotherapy uses this trance state for therapeutic purposes. This means that you are not treated with hypnosis; rather you are treated whilst experiencing hypnosis. Once you have allowed yourself to enter into this trance state, beneficial suggestions that you have been agreed can be given directly to the powerful part of your mind known as your unconscious. In fact, you are reprogramming those areas of your mind that you are unhappy with, whilst at the same time challenging limiting beliefs and behaviours, and gaining insight and wisdom too. Why is the Unconscious Mind Important in Hypnotherapy? You can think of our unconscious mind as an amazing reservoir of strengths and potential that is guarded by your conscious mind. Under hypnosis, our conscious mind is temporarily bypassed – put to one side as it were – allowing your unconscious mind to become receptive to suggestions without any conscious interference. As we said before, it’s a very powerful part of you, one that influences your mental and physical functions. It’s here that all your behaviours, memories, knowledge and habits reside. It is also the place where you will find many of your problems, doubts and negative beliefs hifding away ready to cause havoc in your day-to-day life. 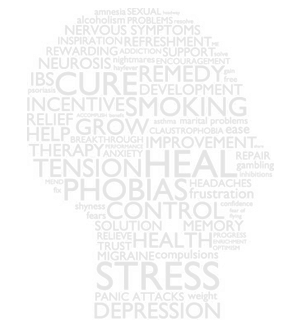 Hypnotherapy highlights these issues, helping you to gain control over those elements of your life that you may feel you have lost control over. can be Treated with Hypnosis? During the first sessions we would agree about a possible course of action and you can choose how to proceed . Normally between 3 to 5 sessions are enough to produce long lasting improvements. To quit smoking only one session is normally required. Luca Occelli is a registered member of the British Society for Clinical Hypnosis. Your personal data will be used for the sole purpose of answering your question. The message sent by this form will be stored in my e-mail account for a maximum period of 24 months. Hypnotherapy is currently available only in the United Kingdom.